Siemens in Sacramento has released the first three Charger mainline diesel locomotives for MARC in Maryland. 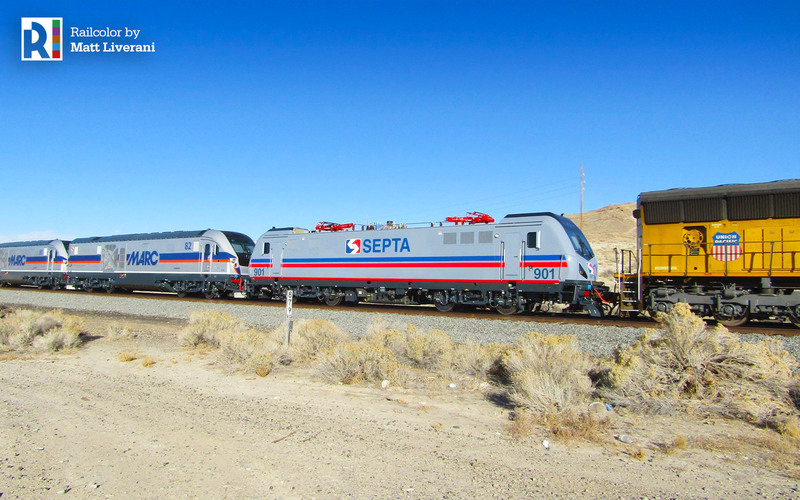 Together with the first SEPTA electric for Pennsylvania these machines were caught on camera by Matt Liverani of the Desert Empire Project at Delle in Utah on 03.12.2017. In August 2015, the Maryland Transit Administration (MTA) decided to purchase eight Charger locomotives. These will be used for MARC (Maryland Area Regional Commuter) passenger services, replacing the electrics (!) of the HHP-8 type (no. 4910–4915) from the 90s. They will be used on MARC’s only electrified line – the Penn Line – connecting Washington, D.C. and Perryville – Maryland- via Baltimore. The order is part of 225-unit framework agreement between the US states and Siemens.